Melt ghee in Kadai/ pan. Add besan and cook it on medium flame till it turns brown and a nice aroma of cooker besan starts. It will take around 15-20 min to cook besan. Stir continuously for an even colour. Once brown, allow the mixture to cool down slightly. Gradually add sugar and mix well. Keep this for cooling. Once completely cooled, make small balls or ladoos of the mixture. Size of the ladoos can vary. 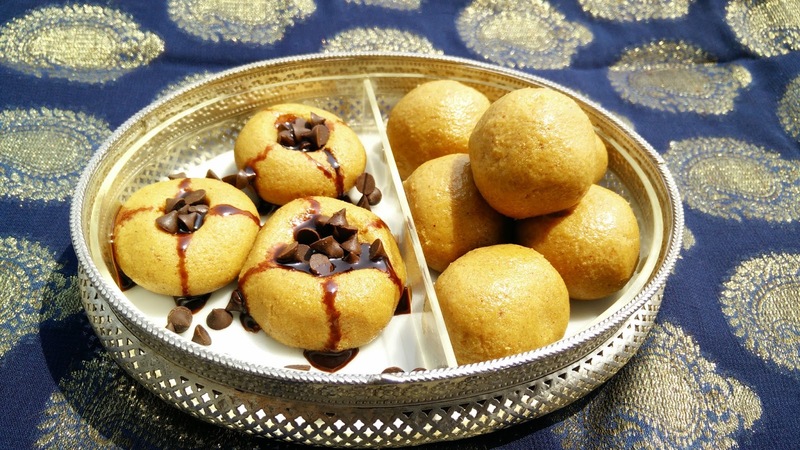 Chocolate variation – Make a well in the centre of the ladoo and add choco nuts in the centre. On the sides of the ladoo, layer chocolate sauce with help of cone. Keep these ladoos in fridge for some time for setting. Chocolate besan ladoos are ready to serve.